Three-dimensional technology -- known as three-D -- gives depth to objects that would otherwise appear two-dimensional, or flat. Three-D makes movies and video games look more realistic. And now it could help save lives. For years, mammograms have played an important role in finding breast cancer. But these X-ray pictures of the human breast often miss dangerous lumps or tumors. And they also produce false positives. A false positive wrongly appears to show suspicious tissue. And that causes painful, unnecessary biopsies to examine that tissue. A new study shows that three-D technology could change the way doctors look for breast cancer. 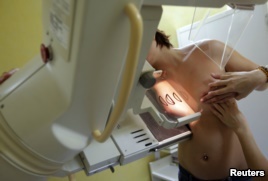 A woman undergoes a mammography exam, a special type of X-ray of the breasts used to detect tumors. When Zulima Palacio discovered she had breast cancer, it already had reached stage three. That means that the cancer was very dangerous. "Even a month before it was detected, I went for a sonogram and they told me, 'You're fine, go home.'" Ms. Palacio is now cancer free. But the standard two-dimensional mammogram missed all three of her tumors. Many doctors - including cancer surgeon Negar Golesorkhi - say standard mammography does not find enough cancerous tumors. She says looking for cancer in dense, thick breast tissue is like looking for a polar bear in a snow storm. In other words, it is very difficult. "When we look for cancer on a mammogram in a dense breast tissue, we're looking for a polar bear in a snow storm, so it would be very difficult to find." A few years ago, the U.S. Food and Drug Administration approved the use of three-D mammography. And three-D technology found Jennifer Hoeft's tumor. "It was a very small tumor. It was only an 8 millimeter tumor that couldn't be felt." Sarah Friedewald is a doctor at Lutheran General Hospital in the U.S. state of Illinois. She led a study to compare the results of three-D and two-D mammography from nearly a half million patients. Dr. Friedewald says they found more cancers using three-D mammograms versus, or compared to, two-D mammograms. And they found more cancers that kill. "We found invasive cancers or the cancers that we worry about, the ones that could potentially kill people more frequently in women who had the 3-D mammogram versus the women who just had the 2-D mammogram." 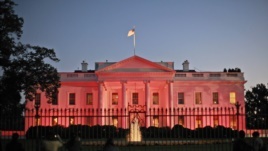 The White House in Washington is bathed in pink light to celebrate Breast Cancer Awareness Month. Dr. Friedewald says tumors that are difficult to see on a standard mammogram are easy to find in 3 dimensions. Jennifer Hoeft is grateful that she had three-D mammography. "I truly, truly believe that the 3-D mammography is what caught my cancer early and is allowing me to pretty much live my life the way I want to." And from VOA Learning English, that's the Health Report. I'm Anna Matteo. After a mammogram, discuss the results with your physician. To date, biopsies are the only effective diagnostic test for fatty livers. I'm pregnant! You want to see the damn sonogram? In addition, with assistance from IBM, the University of Pennsylvania is developing a National Digital Mammography Archive for the US. 1.Dr. Friedewald says they found more cancers using three-D mammograms versus, or compared to, two-D mammograms.